In May memory maker OCZ announced the acquisition of PC Power & Cooling, a firm specialized in high-performance power supplies since 1985. PCP&C is widely known for its excellent range of power supplies but one of the big problems was the limited availability of these power supplies, outside the U.S. it was pretty hard to get your hands on one of these units. Now that PC Power & Cooling is part of the OCZ Technology Group this is starting to change, the PSUs are now more widely available in other markets, including Europe. OCZ hopes the acquisition of PCP&C will help them to create better power supplies and added PCP&C's PSUs to their Premium Power Management lineup. The OCZ ProXStream, GameXStream, StealthXStream , ModXStream and EvoStream are now marketed as mainstream solutions for gamers, modders, enthusiasts and system builders while the PC Power Turbo Cool and Silencer PSUs are considered the premium class for enthusiasts, industrial customized solutions, high-end system integrator PCs and servers. 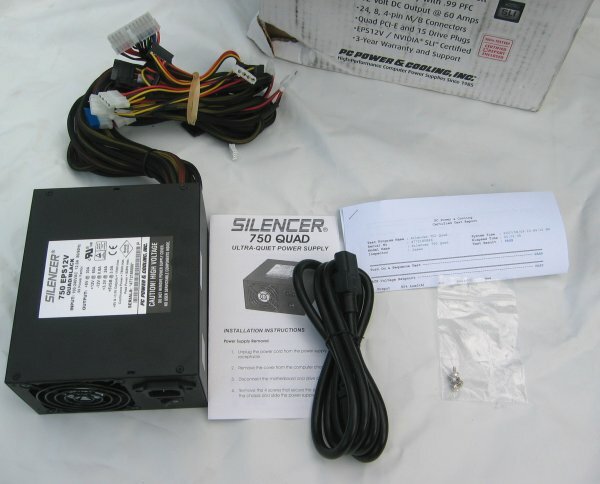 In this review I'm taking a closer look at the PC Power & Cooling Silencer 750 Quad power supply. 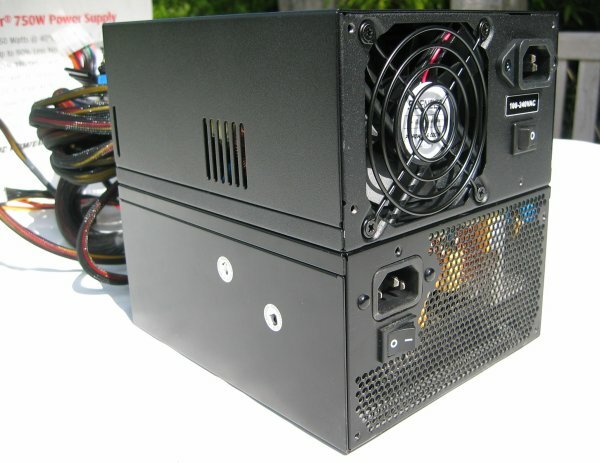 There are three flavors of this PSU: Black, Copper and a red CrossFire Edition. Besides the different color these units are identical, they all have a continuous maximum output of 750W with a peak output of 825W and a max of 60A on the +12V rail. 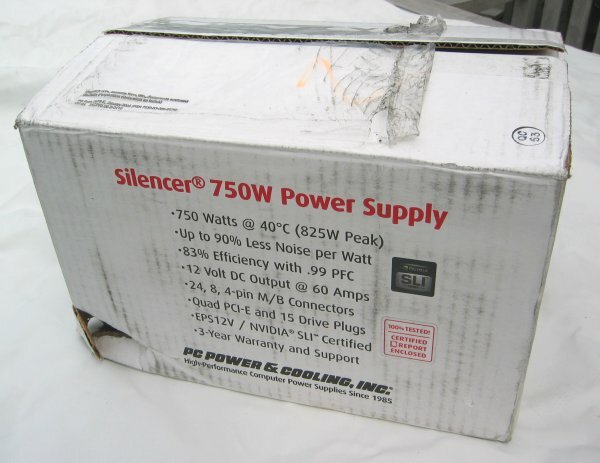 The Silencer 750W PSU ships in a rather unattractive box. 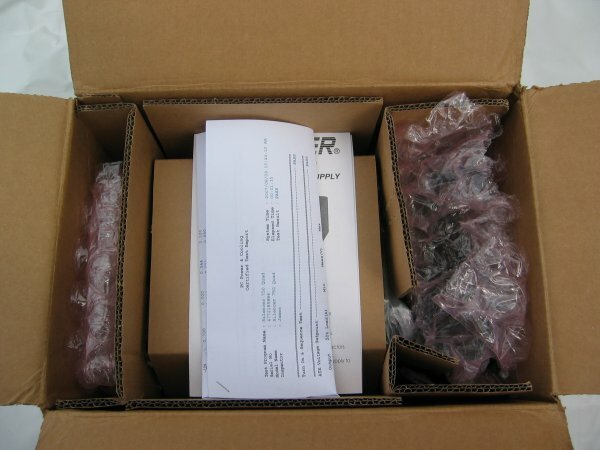 When I received this product I expected to find another box inside the one you can see on the photo but that wasn't the case. I was a bit worried that the PSU might have been damaged during shipping when I saw that one of the corners was punctured but fortunately the PSU was well protected. One of the first things I saw when I opened the box was the test report, this isn't included by default with this PSU but more about that will follow later in this review. Inside the box I found the PSU, power cable, test report, a very short manual and four screws. 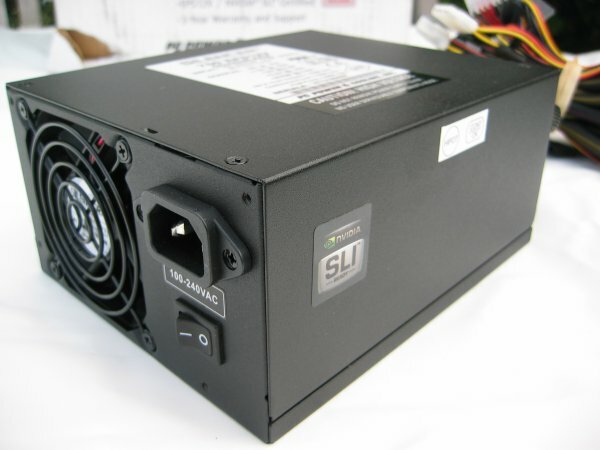 The power cord included with this PSU is a 6' long 14AWG UL power cord designed for power supplies up to 1000W. It's recommended that you swap your old power cord with this one to ensure that the PSU will be able to draw enough current out the power socket. The Silencer 750 won't win any beauty contests, it's design is quite simple and a bit boring. This unit has a matt-black finish and uses a single 80mm fan to keep all the components cool. 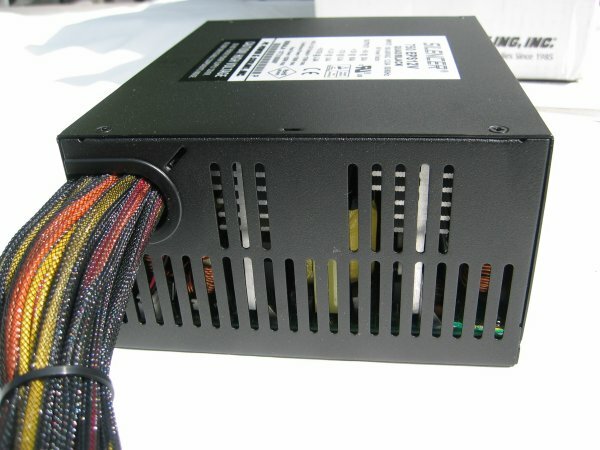 On the left side of the PSU we can see some small ventilation holes. 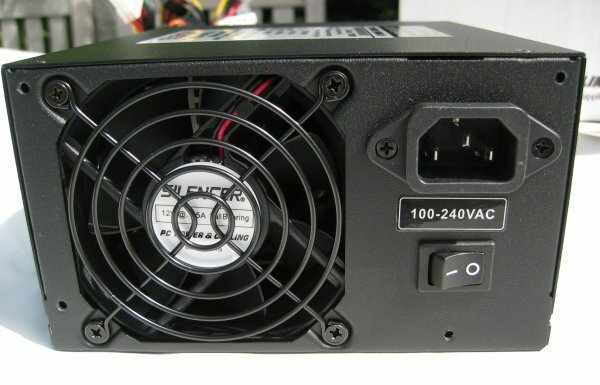 Unlike most power supply makers PC Power & Cooling hasn't jumped on the modular connector train. 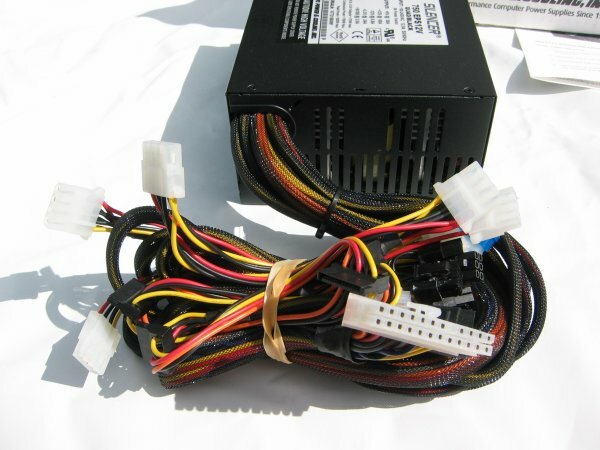 The firm only ships power supplies with regular cables as it believes modular cabling adds too much electrical resistance which hurts overall performance and that modular cables can easily loosen, corrode or even burn which lowers the reliability of this kind of power supplies. But on the other hand I haven't really seen any evidence that supports these claims. The back of the Silencer 750 features lots of ventilation holes, but like I already said the overall external design looks pretty boring. According to PCP&C the Silencer 750 has an efficiency of 83% and is capable of a continuous output of 750W, with 825W peaks. The PSU delivers a max of 30A on the +5V rail, 60A on the +12V rail, 0.8A on the -12V, 24A on the +3.3V and 3A on the +5VSB. The Silencer 750 is cooled by a 80mm fan which is rated at 26-40dBa. 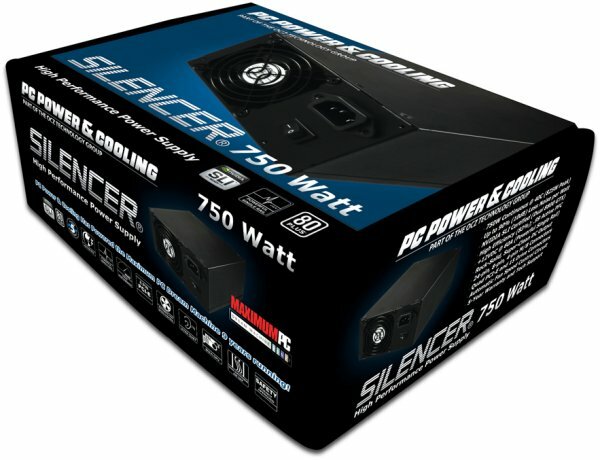 Just for fun I compared the size of the PCP&C Silencer 750 to the SilverStone DA750 which I reviewed a couple of months ago. 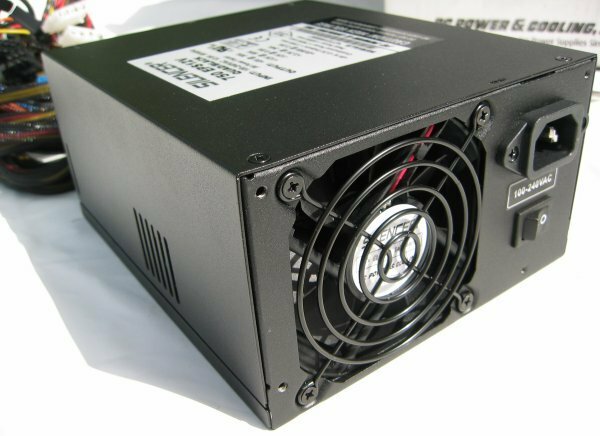 Both 750W models had exactly the same size but are a few centimeters longer than standard ATX power supplies. The larger size of the unit could give installation problems in some cases. Thanks for your comment. I'm planning to buy a decibel meter in the near future but I'm still looking into a way to make proper noise measurements for power supplies, fans and processor coolers. A decibel meter is indeed not really that expensive but IMO noise measurements don't really tell a lot unless you compare them to measurements from other products that were tested under exactly the same conditions. By the way, your $49.99 RadioShack sound meter won't cut it - that device has a range of 50dB to 126dB. I really appreciate the time and effort people put into these reviews, but one of the things that I'm 'shopping' for in reviews is noise measurements. Radio Shack sells a nice Sound Meter for cheap and it would be REALLY great if all reviewers used something like that instead of 'kinda noisy' which tells me nothing.